Our pipe is built to last and we back it up with service to prove it. We understand, when you install a drainage system, it has to last for generations. That’s where Timewell Drainage Products comes in. 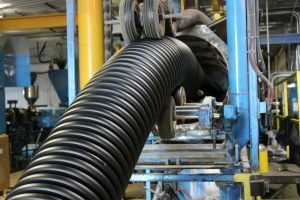 Our team is dedicated to manufacturing only the highest quality HDPE drainage products. Single and dual wall pipe that holds up under pressure and is easy to install. We’re proud to say that our tile has been laboratory and field tested. Raw material characteristics are checked before the plastic resin even gets close to the extruder and every batch of pipe produced is put through a battery of assessments before it leaves our facility. We’re constantly getting feedback from customers in the field about how our pipe performs and we make adjustments accordingly. We’ve invested considerable time and resources in building a state-of-the-art raw material and product testing labs, so when a load of Timewell drainage pipe is delivered to your door, you know it’s the best possible quality. It has been tested, inspected and meets industry standards and strict company imposed quality standards. To find out what goes into making your drainage pipe and how it’s tested, checkout Plastics 101.